So it turns out that Germaine De Randamie is not fighting Ketlen Vieira in Brazil. You have to be careful with reports out of Brazil. Sometimes they jump the gun. 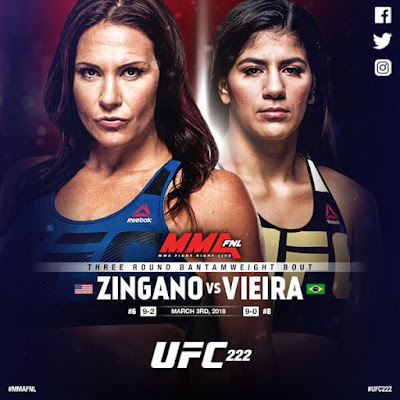 Now we have several outlets led by MMA Brasil reporting that Ketlen will fight Cat Zingano on UFC 222 Mar. 3 at T-Mobile Arena in Las Vegas. I expect this to air on the main card. We haven't seen Cat since she lost to Julianna Pena in July 2016. So where has she been? For one thing, she moved from Colorado to San Diego to train at Alliance MMA. Last summer, there was talk about her possibly challenging Cris Cyborg for the Featherweight belt. She said she was having health problems. She didn't say what the problems were. You'll notice she didn't say injury. I'm not speculating about that. Of course the problem is she's 35 years old on a two fight losing streak. She hasn't won a fight since 2014. And she had reconstructive knee surgery in 2013. Who knows what she will be like? And has she changed since training with Eric Del Fierro at Alliance? Cat has been a very unorthodox fighter in the past. The clock is ticking. Plenty of questions and Cat is running out of time to get answers. Meanwhile, Ketlen looked really good beating Sara McMann by second round submission in her last fight. She didn't look that good in her other two UFC wins. If she wins this fight, she can launch into the Bantamweight title picture. Ketlen is 26 years old and she trains at Nova Uniao in Manaus, Brazil. This looks like the grizzled veteran vs young upstart. And the winner could get a title shot. I like the looks of that.